Q: How do you initially address the mental and emotional strain that accompanies an injured athlete in order to give them hope? Andrews: I normalize it. I suffered many injuries as an athlete. I share my own stories. This always seems to help them open up about what they are going through. Then I do a complete work up of their injury history. Specifically, imagery that is associated with the worst parts of being injured. This gives me specific information about what unresolved mental and emotional blocks their mind is struggling to process and integrate. From this information, we go to work on teaching the athlete's mind how to calm down. They have a context they can work with as it pertains to their injury. In the beginning of our work together, this information is largely unconscious. When we make it conscious, it helps them understand why they are still bothered by the injury. They can see a way out. Q: How does your approach differ for an athlete who will return to his/her sport and one who has a career-ending injury? Andrews: With an injury that is a setback, we work to return them to play with a sense of confidence and a belief that their body is strong and powerful. With a career-ending injury there is a profound sense of grief that the athlete has to work through in addition to the shock they have been through with the injury. We also work to channel their passion into some other area of life that helps them keep that competitive fire and passion alive. Q: How would you describe the depth of emotional, mental, and spiritual suffering an athlete goes through during, and after, the physical elements of the injury are treated? Andrews: I hear words like agonizing, hopeless, despair, angry, depressed, anxious, panic, shock. When you put an athlete's career and identity on the line with a serious diagnosis and recovery period, it is profoundly emotional. Just look at the video of Oklahoma’s Ryan Broyles on the sidelines after he learned he had torn his ACL. He was upset then and he still has a lot to work through with his upcoming surgery and rehab. Q: On your website, you state that you help athletes remove blocks that inhibit peak performance and unleash their natural power. Does every athlete possess the raw materials to bounce back mentally after an injury or do some consciously choose to give up? Andrews: I believe that there is a wide spectrum here. Some athletes are blessed with a very resilient spirit. They bounce back with little or no help on the psychological aspects of recovery. Others find it very difficult to overcome the stress and upset they face when injured. I think those that give up have not had the opportunity to address the mental and emotional impact of their injury. They have been cleared to play physically but still suffer from fears and anxieties that they can’t overcome. Most don’t have the tools to get back mentally so in frustration or hopelessness they quit. For many, this can lead to other problems down the road. Q: Tell me about how unresolved issues from injuries and the fear of re-injury can hinder an athlete’s progress, even if they’ve been cleared to play again? Andrews: The more upsetting and significant the injury, the more powerful the imprint in the brain. When an athlete attempts to come back, the mind will do everything in its power to protect them from re-injury. They might favor an injured knee or change release points and arm slots on a certain pitch. Mentally, they are hesitant, and play with lower levels of confidence. For some this sets them up for re-injury or suffering a different injury. I see many athletes who have experienced a whole string of injuries. They are overwhelmed with the emotional and mental burden they carry. It is like a computer that has too many programs running. Their mind runs slow and sometimes crashes. Q: What is the most rewarding part of what you do for athletes? Andrews: Being able to watch them compete at extremely high levels again. To be able to watch them laugh, celebrate, enjoy the game, and play with passion again is exhilarating. An injured athlete can learn so much about themselves in the process of recovery. When they return to play, they are not the same athlete they were before they were injured. When they work through the mental aspects of recovery, they return to play wiser, more mature, and resilient. Q: Give one example of how you coached an athlete from despair and hopelessness to a strong mental state of inner victory. Andrews: I worked with a football player who had twenty-four D-1 scholarships offered to him. In the summer before his senior year, he injured his knee. This injury ended his career. He was depressed and filled with anxiety. He had no direction in his life. After we worked through the mental and emotional blocks related to his injury, and his abrupt disconnect from his sport, his spark for life reignited. He went back to college and began pursuing a degree that would enable him to help young people. He loved life again and could accept that his career as a football player was over. He found another sport to channel his passion and competitive fire into. The light in his eyes returned and he was at peace. About Robert Andrews: Robert is the Founder & Director of The Institute of Sports Psychology in Houston, Texas. He is the sports psychology consultant for the USA men’s gymnastics team, coaches, and staff. He works with Olympic, professional, college, and high school athletes and coaches. His areas of specialization are helping athletes overcome mental blocks associated with sports-related injuries and helping athletes and coaches achieve peak levels in performance. Robert can be reached at (713) 522-2200 or email him at robertandrews@tinssp.com. Michelle Hill is the Strong Copy Quarterback at Winning Proof. She helps current and retired pro athletes increase their success score by writing website content and other marketing material. Great question and answer article!! The purpose of this piece is not to focus so much on anything fantasy-related, although if anything I hit on here helps you with line-up decisions, well then that's just gravy. But what I really hope to do here is to highlight these two surgical procedures for our baseball players who read the site and give you a little more background as to what they are specifically and do a little compare/contrast. All of this from an athletic trainer's perspective (and fantasy player as well) to hopefully give you more insight when you hear one of these terms or a teammate suffers one of these injuries in the near future. Because it WILL happen eventually. Fair warning: there will be some medical jargon tossed around, but hopefully not too much that it gets boring. First, the labrum. There is actually a labrum associated with the hip joint. Both the hip and the shoulder are ball-and-socket joints, with the end of one bone forming a "ball" that fits into another bone's "socket." The labrum is a piece of cartilage that serves to deepen the socket. The hip is a much deeper socket than the shoulder, which allows for more range of motion (i.e. it allows the shoulder to throw a ball overhead). For the rest of this article, the term labrum and labral repair will refer to the shoulder labrum. The shoulder wasn't made to throw a ball in an overhead motion with the force and frequency that a baseball pitcher's position requires. It can do it, and do it very well, but the odds of something breaking down over time or of something "abnormal" developing are very high. When this happens, sometimes a surgical procedure is required to repair or "clean-up" the damage. A typical injury to the labrum is a SLAP lesion. SLAP: "Superior Labral tear, Anterior-to-Posterior" refers to the direction of the cartilage tear. Symptoms for a pitcher include loss of velocity, a dull ache, location issues, and trouble sleeping. Often there is no "I felt it on one pitch" complaint; it's more of a build-up over time. The picture above shows the tear before and then after the surgery to repair it. Once it's torn, it's torn—there is no "letting it heal on its own" thing here. It must be repaired, either arthroscopically or through an open procedure. Does it work? Yes and no. Washington Nationals wunderkind Stephen Strasburg is the type of pitcher that can instantly transform a franchise, as evidenced by the incredible start to his career in 2010. The unbelievable hype was lived up to, as Strasburg clearly demonstrated he can pitch at the major league level. Plus, the fans wanted to see what this kid could do, and they turned out in droves. What an impact he had in a short 2010—from stats to economic impact—Strasburg has the “it” factor. But things took a turn in the opposite direction nearing the end of the 2010 season. He had some elbow soreness, went on the DL, and never really recovered. Finally it was diagnosed that he had a torn ulnar collateral ligament, and had to have it surgically repaired. 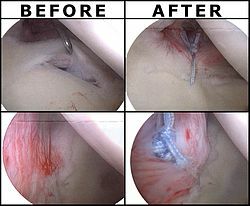 This procedure is known as Tommy John surgery, named after the pitcher who first had it done on his arm. The surgery was developed and pioneered by the legendary Dr. Frank Jobe. Chronic Injuries in Athletes: Are they busts, or is there more to it? So the news broke a few weeks ago that Greg Oden, the heralded former No. 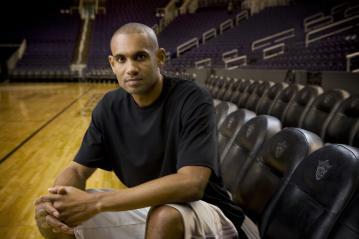 1 draft pick of the Portland Trailblazers, will miss yet another season. Three years, three major surgeries. First, it was a cartilage injury that required microfracture surgery on his right knee. Last year, he sustained a fractured patella on his left knee. Now, unrelated to the patella, is a new injury to his left knee, also requiring microfracture surgery. This guy was supposed to be the next Kevin Durant, right? Wait, my bad…same draft. That's right…the Blazers PASSED on Durant to get Oden. That's another story. Anyway, Oden was to be a star, and now folks are calling him a bust. With two full weeks of practice under our belts, we (DeMatha) are off to a great start. Our players are starting to jell into a cohesive unit. We are still miles away from where we need to be, but we are moving in the right direction. We have several scrimmages lined up, to help us fine tune things, prior to our season opener on December 1st. Our players are looking forward to competing against someone other than themselves! Despite the great start, we are physically banged up right now. Our guys compete so hard in practice… there is no shortage of bumps, bruises, and sore muscles. Regardless of how thorough our pre-season strength & conditioning program was… the intensity, volume, and contact has been turned up ten-fold since practice began. It’s normal for players to be a bit banged up in the first few weeks. Their bodies (and minds) are getting acclimated to the rigors of full contact practices. It doesn’t mean our pre-season training was deficient (believe me, it wasn’t). This is just another step up the “intensity ladder.” Our guys were sore the first couple of weeks of our pre-season training… but they adjusted. The same will happen now that practice has begun. A basketball player’s feet are important. Let me rephrase that. A basketball player’s feet are extremely important. If you don't fully rehab an injury, you could be susceptible to injuring the other side of your body.